With windows shutters you can take advantage of a range of extra benefits over the other options available. The great news is they can be custom made to fit any window no matter the shape, offering a traditional furnishing for your windows. Window shutters give a bespoke finish and you’ll have the opportunity to control light and privacy. They’re also extremely low maintenance and will aid with your home’s sound and heat insulation too. If your property is close to the street then you’ve probably always had a problem with the amount of privacy your home has. No doubt you’ve found yourself closer the curtains earlier than normal just to escape prying eyes. But with window shutters you can continue to let natural light in by closing the lower section and keeping the upper tier open. This not only helps you control the level of light but ensures your privacy is maintained too. With window shutters you have the dual benefit of both sound and thermal insulation. When closed, the shutters act as insulation, restricting the amount of sound that can enter your home, whilst reducing the amount of heat escaping. As such you’ll be able to reduce those expensive energy bills which continue to creep up every year. Carpets and furniture can be heavily affected by the sun’s UV rays and it’s not uncommon to see your furnishings bleached by the natural sunlight. However, with window shutters you have the chance to limit direct UV rays and ensure your furnishings stay in excellent condition for much longer. There is a UV protective layer on the shutters themselves too to prevent the paint or wood stain fading or warping as well. Kerb appeal is vital to any home and signifies how your property looks from the outside. It’s not just the front garden you need to keep prim and proper because the front door and windows are also included in kerb appeal. 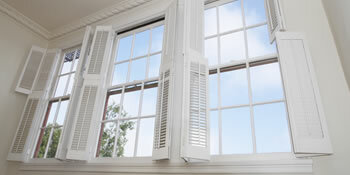 Window shutters provide the opportunity to disguise old uPVC windows without needing to fork out for full replacements. And in fact, if the shutters are a permanent fixture you could add value to the home. The last thing you want is to be constantly cleaning the window shutters to ensure they’re looking good. And you don’t have to, as they require very little maintenance with just a quick wipe with a wet cloth being sufficient. Dust and dirt is enough to remove and won’t even take you five minutes. Project: Wanting a wooden shutter for my living room window, so after a quote please. Project: Quotes required. Want two window shutters in kitchen hatches in Sandhaven public hall. Project: White exterior shutters x2, 54" x 12". Current wooden shutters are starting to rot so need replaced. Project: 10inch oak T and G floor boards. Properties are given an energy rating depending on exactly how efficient they are and ratings are presented in the data down below. This ranges from A, by far the most energy efficient, to G, the very least efficient. With a higher rating you're more likely to have cheaper energy bills as more heat is going to be retained in the home. It is possible to boost your home's efficiency with insulation such as double glazing, loft lagging or wall cavity insulation. The information underneath indicates the numerous types of houses in Uk. Essentially the most common homes across the UK are detached and semi-detached houses. Other types of households consist of terraced houses, flats, converted flats and bungalows. The data beneath offers an indication for the number of properties in Uk that are central heated and non-central heated. Households are heated by a range of sources which reflect how pricy yearly energy bills will probably be. Types of central heating include gas, electricity, oil, solid fuel and LPG boilers. Changing exactly how your house is heated can easily see you with cheaper bills. The data below displays the spread of houses heated up by different fuels. Around the United Kingdom the most common by far and away are gas heated properties, followed by electricity and then oil. Biomass boilers are also growing in popularity, heated by renewable products including wood pellets or agricultural waste.|Homes in the UK are heated up by a variety of fuels, including gas, electricity, oil, solid fuel and LPG boilers. Each fuel has a varying cost associated with it and that means you could find yourself with less costly energy bills by altering how your household is heated. Even solar thermal panels are being regarded as by many people in order to lower heating bills for the years to come.